At Citiskate Waterloo lessons are divided into three groups with an instructor in each group: (L1) absolute beginners, (L2) lower intermediate skaters, (L3) Upper intermediates/Advanced. All courses feature slalom/skate to ski techniques. As an absolute beginner you will learn correct skate set-up and falling(! ), how to get up (very useful! ), balance and basic striding (skating), stopping which includes heel braking and also the A-frame stop. Edging and rotation movement is used throughout and members of this group will use slalom cones to develop technique. 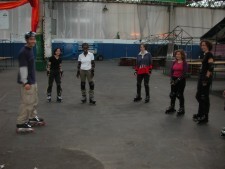 Citiskate instructors are particularly dedicated to building the confidence of skaters in this group. Lower-intermediate skaters; as above plus intermediate level stopping, turning, transitions, better and more graceful gliding as well as some speed moves...and intermediate speed skating. Backward skating is comprehensively explained. Intermediate level tricks are also covered. 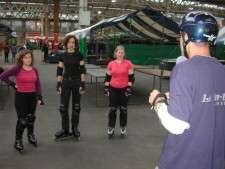 Upper-intermediate skaters usually have considerable skating experience and/or some ski or ice skating related knowledge. 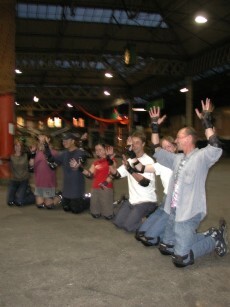 Note that this group covers intermediate and above skills and caters for participants wishing to excel their skating! The class features: advanced level tricks, slalom and, the real reason we all skate, exhibition stuff such as slalom, the side surf and backwards tricks! Note that we rent you our skates for the entire duration of the course, you get to take them away to allow you to practice between sessions and they come with knee, wrist and elbow pads, together with a handy skate bag! We only rent good quality skates from top brands like Rollerblade, Salomon or K2. £20pp discount and head booker goes free. These promotions cannot be used in conjunction with any other offer and applicants must apply and pay at the same time. The venue is INDOOR, so lessons are rain or shine! The next course starts on the dates above. All sessions are on Saturdays, sessions on other days will appear later in the year. You sign up for a FOUR-WEEK course and spaces are limited - please book well in advance. Every course it is the same: phone calls from bankers, accountants, artists, lawyers, TV aerial erectors, entrepreneurs etc. sobbing as they've left it too late! Buy a course as a gift for The Person That Has Everything. Email us at the address below for details. If you wish to be informed when the details of further courses (starting later in 2012) are finalised send email us. We regret we can only inform you via email. (c) 2012 Citiskate Inline UK. All rights reserved.